Y didn’t U tell me that I loved U? What are the possible localizations of a screen? Different figures of condition in a conceivable structure of space and time, destabilization of the linear space by masks, a subject’s continuous search for points of reference in an empty field, permutation as a meander approach to rhetorics. 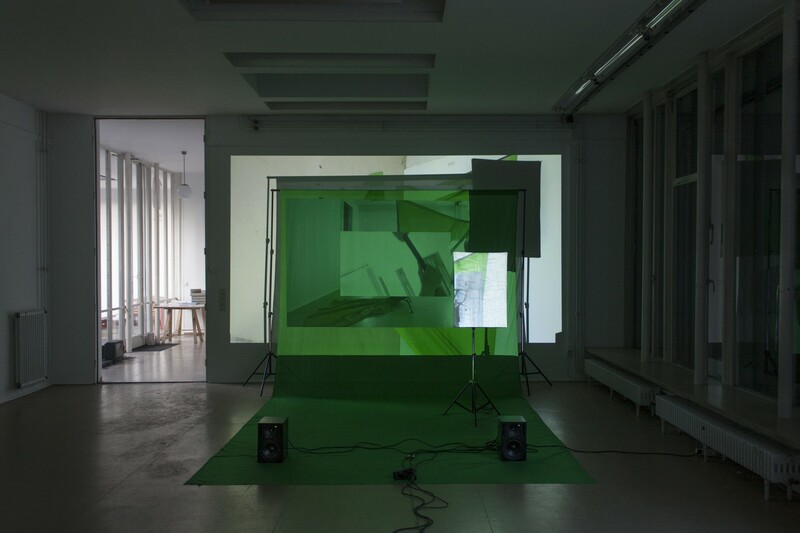 Seen in relation to the irredeemable promise of self-positioning „Spin, Spin, Spin, My Green Screen Skin“ becomes a self-contemplating, machine like installation that refigures its video-graphic functional elements to a constantly looping movement around itself. Breyer P-Orridge, Genesis: Thee Psychick Bible. Thee Apocryphal Scriptures ov Genesis Breyer P-Orridge and Thee Third Mind ov Thee Temple ov Psychick Youth. Port Townsend, WA: Feral House: 2009. Gorsen, Peter: Subjektlose Kunst. In: Gorsen, Peter: Transformierte Alltäglichkeit oder Transzendenz der Kunst. Reflexionen zur Entästhetisierung. Frankfurt/Main: Europäische Verlagsanstalt, 1981. S. 57-74. Haraway, Donna: Ein Manifest für Cyborgs. In: Haraway, Donna: Die Neuerfindung der Natur. Primaten, Cyborgs und Frauen. Frankfurt a. M. und New York: Campus Verlag, 1995. S. 33-72. Stakemeier, Kerstin; Witzgall, Susanne (Hrsg. ): Fragile Identitäten. Berlin: Diaphanes, 2015. Stakemeier, Kerstin; Witzgall, Susanne (Hrsg. ): Macht des Materials – Politik der Materialität. Berlin: Diaphanes, 2014.